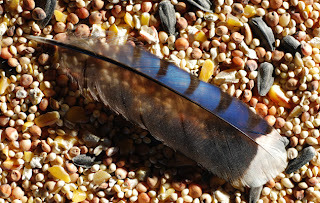 It surprises most people when they find out that it is illegal to pick up or have even a Jay feather. Why? The main law in the USA is the Migratory Bird Act. The Act doesn’t make a difference between picking up a molted feather and shooting a bird for its feathers. The Act is a broad brush tool , easier to enforce when someone is found with a feather rather than having to prove they killed a bird. It is not easy or possible to tell the difference between a feather from a road-killed bird from one that was shot or trapped. However, a molted feather should now days be easy to distinguish from a plucked feather by looking at it under a microscope. I think it would be nice if there was an exception for molted feathers from songbirds – but not to sell them. So, having any feather from almost every bird in North America is illegal. Crows, pigeons, starlings and game birds being the exceptions. That's why I started out my feather obsession just photographing feathers. That way I didn’t need to have them. Since now I work more directly with feathers in shadowboxes, I just make sure that the feathers I get are either not from birds native to the USA or are from the few kinds in my country that I can use. Fortunately for me, some of the most beautifully feathered birds are not migratory and are kept in private aviaries and zoos and these birds naturally shed their feathers each year. I even raise a couple pairs of my own: Impeyan Pheasants, native to Nepal and Black Francolins, native to Pakistan.